Ground pork sautéed with zucchini and corn makes the filling for these green salsa verde enchiladas. Home-canned sauces enjoyed all year long. Do you can? I've made jam over the years, but I really need to give a shout out to Marisa of Food in Jars: Preserving in Small Batches Year-Round because a year ago, through her wonderful blog, she gave me permission to can 'just a little bit' of something without making a Big Production out of it. Last summer, when my local grocery store was roasting fresh Hatch chilies in the parking lot and the farm share had tomatillos every single week, I decided to try my hand at canning salsa verde. I first tried salsa verde the previous winter when I made tongue tacos from the cow in the freezer. My family tolerated the tongue, but we all loved the salsa verde and I resolved to learn how to make it when the farm share tomatillos overwhelmed me appeared in the box. 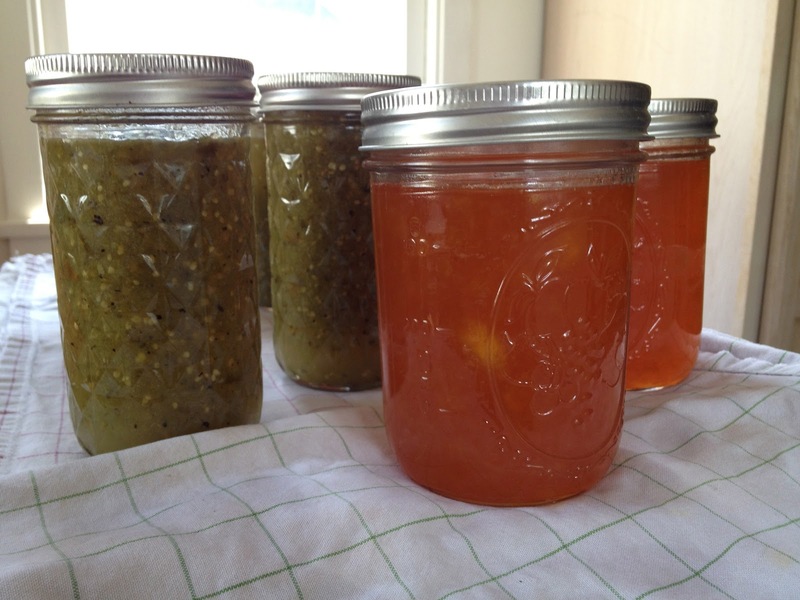 I followed the Ball® Blue Book recipe, subbed the roasted Hatch chilies, and this was the result--six lovely jelly jars of salsa verde. Since I had the canning pot up from the basement and hot water anyway, I figured I'd make some peach jam from peaches that had been hanging out in the freezer, awaiting a canning day and some pectin. But what to make with it? We haven't finished up the first cow, and most cows only have 1 tongue [not that we were pantingly eager to experience those tacos again]. 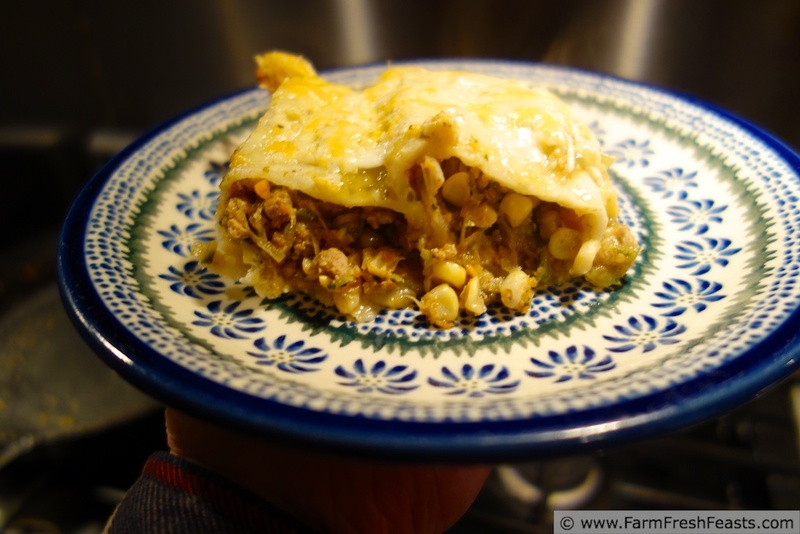 We are loving enchiladas these days, so I figured an enchilada recipe would be a neat way to take my salsa verde for a test drive. 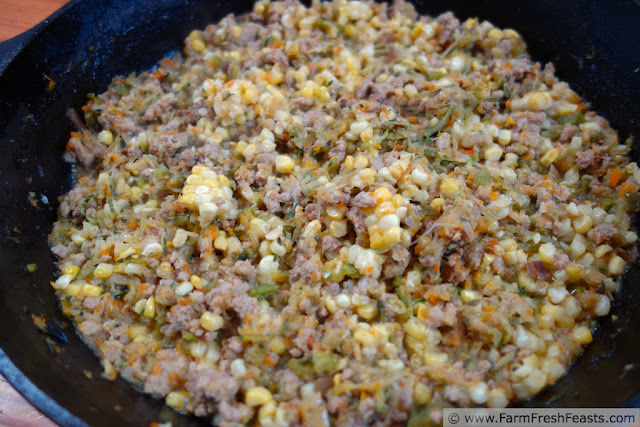 I found some ground pork marked down at the grocery store and grabbed a bag of zucchini out of the freezer. Freezer? Yes, I wrote this post up during the snowy winter, dreaming of temps above the single digits while sharing how I feed my family from our garden and CSA farm share all year 'round. If you're overrun with zucchini this summer, shred some up--I love my food processor because it has a fine shred disc which is perfect for zucchini, carrots, or cheese. I freeze bags of shredded zucchini flat in 1 cup portions. But I digress . . . where was I? Oh, right. 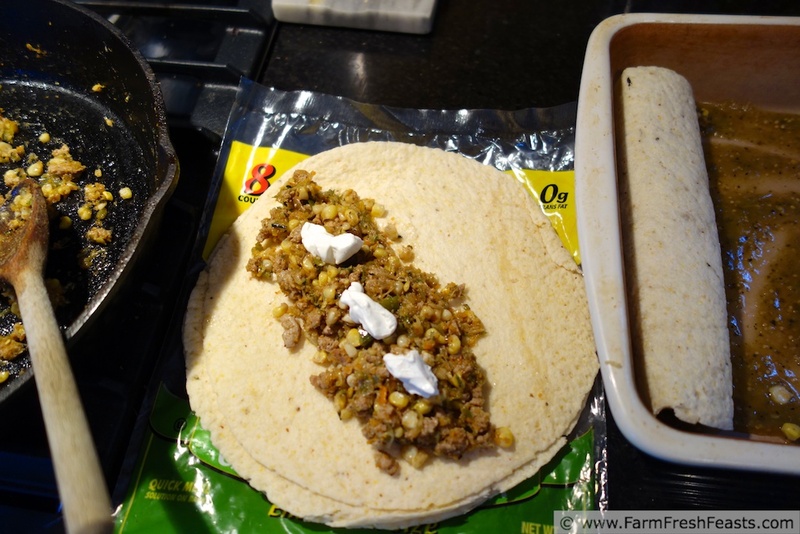 Ground pork, zucchini, and you know what else would be good stuffed into that tortilla? Corn. Grabbed some of that, too. You'll notice that this enchilada recipe serves 6, but only uses 1/2 pound of meat. We are omnivores, but I like to serve less meat and more veggies, so this is another way to stretch a pound of meat. And tasty, too! Preheat oven to 350 degrees Fahrenheit and a large skillet over medium heat. Sauté the pork until it is no longer pink, about 8-10 minutes. Drain fat. Add in the onion through celery and spices. Sauté until veggies are softened, about 8-10 minutes. Add in zucchini and corn, stir to combine thoroughly, and cook mixture over medium heat another 10 minutes until everything is heated through. Pour about 2 ounces of salsa verde in a 9 inch square baking dish. 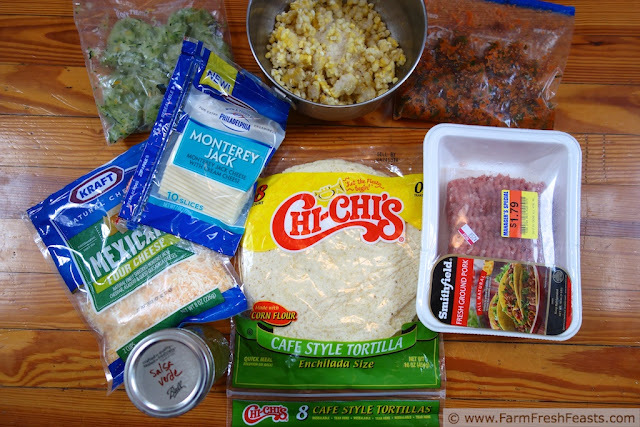 Divide mixture evenly between 6 tortillas. Top each with a tablespoon of sour cream. Roll up tortillas and lay seam side down in prepared pan. Top rolled tortillas with the rest of the salsa verde, slices of cheese, and the shredded cheese. Bake for 30 minutes until cheese is melted and beginning to brown around the edges. Serve with extra sour cream and salsa verde on the side. Since I got my feet wet (so to speak) with salsa verde, I've canned a whole bunch of tomatoes, pressure canned spaghetti sauce (thanks again, Linda! ), put up pickled peppers, and more. I share my current canning projects on my Facebook page, and I've recently joined Pinterest where I've got a Preserving The Harvest board. I urge you to try a little canning--with a few tools (the only bespoke stuff I started with was a wide funnel and a jar lifter) you can put up an amazing variety of fruits and veggies while they are cheap and plentiful. Then, when your garden beds are bare, your pantry shelves will remind you of summer and help keep you fed. This post is shared with the Clever Chicks Blog Hop, Tasty Tuesdays, Mostly Homemade Mondays, Wednesday Fresh Foods Link Up, What's Cooking Wednesday, What's In The Box, From the Farm Blog Hop. Tell you what--you fix the tongue, and I'll eat it with you! It was a lot of effort to prepare (more so than tail, and tail had a much higher rate of return, flavor-wise, IMHO) and while it was fine, the tongue was just 'fine' to us. Tolerated. I'd be happy to eat it if you fixed it your way! I will do my best to remind you! The grocery store down the street is roasted Hatch chiles today, so I'm going to stock up in advance of the tomatillos to come. I can't wait to try this, since I actually am harvesting zucchini for the first time.. I like the idea of salsa verde instead of enchilada sauce. How wonderful to have a zucchini harvest! The mystery squash that's been growing around my garden this summer seems to be pumpkin-like, so I envision a lot of winter squash recipes this fall. I've made enchilada sauce from slow roasted tomatoes (from Andrea at Recipes for Divine Living) but the green appeals to me more these days. yummity, yum, yum, yum...I have decided that on my next move (which could happen any time now knowing us) I'm moving in with you. Any space? There's space in the basement, but I'll warn you it's a teeny old house! You never know where we'll live next, though, or for how long we're here.